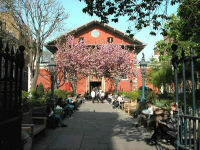 Take the opportunity to visit this beautiful Inigo Jones church, full of memorials to famous men and women of the theatre and films, and itself a star of both George Bernard Shaw�s Pygmalion and Lerner & Loewe�s My Fair Lady, as it was under the portico that Henry Higgins first met Eliza Doolittle. The main entrance to St Paul's Church is at the west end of Covent Garden Piazza. You can enter the churchyard from King Street, Henrietta Street and Bedford Street. By bus: The easiest way to find St Paul's Church is to take any of the following buses to the Strand and walk 5 minutes to Covent Garden: 6, 9, 11, 13, 15, 23, 77a, 91, 139, and 176. By car: not advisable, even on a Sunday. Residents' Parking applies all day, every day. Pay & Display is free at the weekend, but in great demand as the area is a popular tourist attraction. There are NCP car parks in St. Martin's Lane and Shelton Street. By underground: A good choice. Covent Garden station, although close to the church, is not recommended on a Sunday as it is then usually "Exit Only", but there are plenty of other stations nearby: Charing Cross (Northern and Bakerloo lines), Holborn (Piccadilly and Central lines), Embankment (Circle and District lines) and Leicester Square (Northern and Piccadilly lines). Check the above map with a London A-Z to find your way from these stations. The Transport for London website tfl.gov.uk is also useful. By bike: Securing your bike in the Covent Garden area may not be easy. There are dedicated cycle stands in Southampton Street and adjacent streets.